35g portion = 1 of 5 a day. 100% natural ingredients with no added sugar or syrups. This product only contains naturally occurring sugars. Gluten, Wheat & Dairy Free. Cold-pressed, never baked. 100% Vegan. 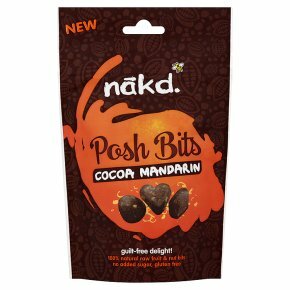 Kosher - KLBD.Nakd Cocoa Mandarin has a delightfully indulgent chocolatey taste combined with the zingy, juicy flavour of mandarin. Each delectable piece of Cocoa Mandarin is made from yummy natural ingredients, such as fruit & nuts, and have no added sugar or syrups. Simply delicious, guilt free snacking!